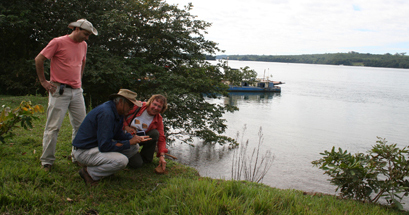 Professor Janet Hooke from the University’s Earth Surface Dynamics group in the School of Environmental Sciences is photographed here in Brazil conducting field work on river dynamics as part of a visit to the State University of Sao Paulo (UNESP). The team investigated the Parana River, a large braided river, now shaped by dams for hydroelectric power (HEP) plants, and some of its meandering tributaries. The trip provided the opportunity for postgraduate training courses at sites on tropical rivers, to understand bank erosion, bar sedimentation and channel changes. Professor Hooke also gave a series of workshops and lectures. Collaboration with the University has already brought about a six month opportunity for a Sao Paulo postgraduate to study at Liverpool. Professor Hooke said: “Field work in countries like Brazil, which have such fascinating river systems, is important to our understanding of environmental management and conservation.